Bangladesh fans were left shell-shocked after the humiliation meted out to their team by West Indies on 4 March. They saw their "Tigers" lose by nine wickets after scoring just 58 runs in their innings - their second loss in their first three matches. But enthusiasm for the World Cup remains undimmed. The signs were there when tickets for the Cricket World Cup went on sale - fans stood in queues for more than 48 hours to get hold of them and the opening ceremony in Dhaka drew admiration from around the world. Ordinary citizens and civil society groups see that success as proof that Bangladesh can do things properly. Aly Zaker, head of a local advertising agency said it showed Bangladesh had a democratic and peaceful society. "Without these conditions it is not possible to organise a mega event like this", said Zaker. Bangladeshi fans have high hopes of beating England on 11 March in Chittagong, as they see Andrew Strauss's men as "unpredictable". "If our players can give their best in the field then we can beat England," said Abdul Hakim, a cricket fan. The tournament is the centre of all discussion in tea shops, cafes and on street corners. "From telephone conversations to Facebook, everywhere, cricket dominates the discussion," said Indira Bhattacharya. Bangladesh will host eight matches, including two quarter-finals, and Dhaka and the port city of Chittagong have been dressed up and cleaned up to give them a festive look. For city officials, 'beautification' is the key to presenting the right image. They instructed all owners of houses located around the stadium to put on a fresh coat of paint. And the police in Dhaka drove out all vehicles in dilapidated condition from the city. The city centres have been decorated with folksy Bangladeshi art and crafts and the festive mood has caught on everywhere, especially among the youth. 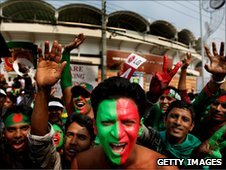 Dhaka hosted the first three matches played by Bangladesh - against India, Ireland and West Indies - and thousands milled about outside the stadium, without tickets but full of hope. "It's a dream that World Cup is being held here," said Shahabad Husain. He was part of that "dream" even though he didn't manage to get a ticket for the opening match against India. Like hundreds of others, Hossain simply turned up and joined in the celebrations. Many fans stand beside the road and wave their hands when the Bangladesh cricket team are on the way to stadium and hotel. Then there are the giant television screens around Dhaka which have helped to soften the blow delivered by power shortages, that have in the past led to irate fans attacking electricity company offices. Hundreds of spectators gather here to watch the matches and a back-up power supply is on hand. So, what about the local team's prospects? Bangladeshi fans are expecting a lot from a team they feel can beat any other at home. Hopes are so high because captain Shakib Al Hasan is the ICC's top-ranked all-rounder, while opening bat Tamim Iqbal can destroy any attack on his day. "We have already beaten Ireland. We will beat Netherlands. And among two teams - England and South Africa - we can beat one of them. That will pave the way for the second round," said Mahmud Hassan. Former players are also upbeat. "I would not be surprised to see Bangladesh in the semi-finals because the team has the capability," said ex-skipper Khaled Mahmood Sujon. Co-hosting the Cricket World Cup is being seen here as one of the biggest events in the country's history since independence in 1971. "People of this country take cricket religiously. We are very fortunate to be one of the organisers. We are proud," said Bangladesh Cricket Board president AHM Mostofa Kamal. And former BCB president Saber Hossain Chowdhury believes co-hosting the World Cup will help rebrand the image of the country. "Bangladesh is known as a country of natural calamities. But now it is being discussed for its cricket," said Chowdhury. ''In Bangladesh cricket is not simply a game, it is a symbol of national unity."